Book Your San Francisco Fishing Trip or Private Boat Party Today! Select Your Trip, Buy a license, Pack your meals…. And leave all the rest to Captain Steve Talmadge! Trip Prices: Include everything except fishing license and your meal. $250.00 per person- maximum of 6 anglers. Must have a minimum of 4 anglers to go. First 2 salmon weights are free. Capt. Steve usually leaves the dock by 6:30 a.m. and returns at a time that works for the group. If you charter the boat, you can adjust the fishing time to fit your schedule. There is light tackle available on board for the sportsman. Live bait is usually available. *Sharks,Salmon, Striped Bass, Halibut, Rockfish, Ling Cod. Book Your Summer Boat Party Trip Now! **Sturgeon, Striped Bass – Most trips can go 10-12 hours – if you charter the boat, you can adjust the fishing time to fit your schedule. Captain. Steve prefers to fish the good tides, which is better for sturgeon fishing. This means longer trips and start times vary, it could be morning, noon or night. Day & night trips are available. All trips include everything needed except your fishing license and your meals (complimentary snacks and beverages are available). You will use Hand built custom rods by Mac’s Custom Rods are set up by Captain and crew. Capt. Steve Talmadge uses Avet reels on all Mac’s custom rods. There are also rods & reels available for lefties! And, of course your own equipment is always welcome. Ask Captain Steve Talmadge any questions about how to best set up your rod & reel prior to your trip. 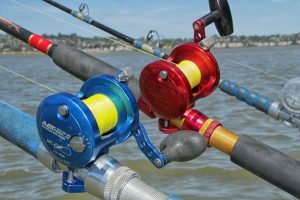 Two speed reels are available for children (or anyone else who wants to use one). Deck chairs are available. All trips include the captain and crews personal service.They will assist with everything, even casting if needed. However, you should fight and land your own fish. The crew will clean and fillet your fish before you leave. Capt. Steve also conducts fishing seminars, so feel free to ask questions at any time. On board seminars can also be arranged. 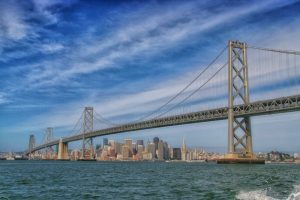 When fishing San Francisco Bay, you may experience spectacular views of San Francisco, the Golden Gate Bridge, Alcatraz Island, Angel Island, the Farallon Islands, the Pacific Coast, harbor seals, sea lions, many types of birds and if you are really lucky, an occasional whale may appear. People visit from all over the world to see these sights! Bring your camera; the Captain is also a photographer and always willing to take pictures of you and your catch!